Boneyard | Where is Whitney? I planned to camp at Mead Lake before entering Las Vegas. Along the road I was distracted by the little Route 66 town of Seligman, Arizona. I had to stop for a float and to walk the streets filled with antique cars and vintage storefronts. 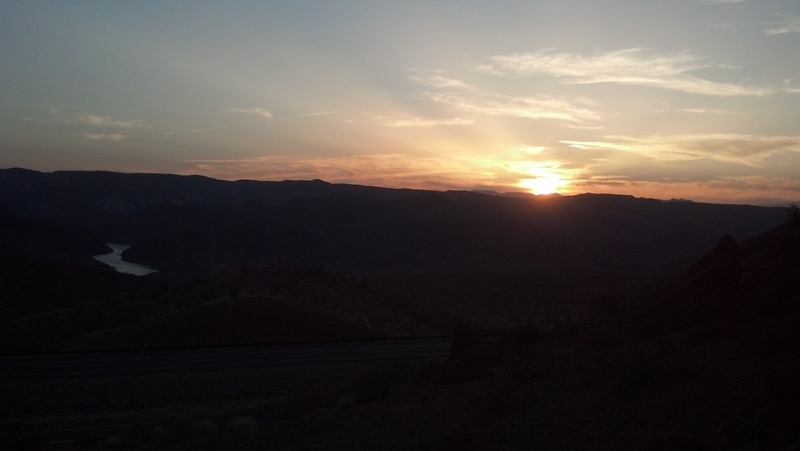 Seligman put me about an hour off of my estimated arrival time and I pulled into the Lake Mead area to witness a sunset over that strange landscape and the locked doors of the visitor’s center. After determining that it would be impossible to find a camping spot in the dark, I headed to the little town of Boulder City, NV. While the town looked quite cozy and cute, even after dark it was ridiculously expensive. My jaw dropped at the price of the absolute seediest cheap motel in town. Obviously a converted old hotel, I checked into my room at the USA Hostel. I opened the door on three college girls from the U.K. spraying perfume and dry shampoo. They were trying on their fancy dresses and heels about to go out for some “posh” nightlife at one of those “posh” casinos. I asked if I could go along and I tried not to look like the hipster road bum I had become. We waited for forever for a cab, so long that we about gave up on going out. It finally showed up around 12:30 a.m.
Posted in Art, Life, Nature, Nevada, Quirky Attractions, Southwest, United States and tagged Art Galleries, Boneyard, Burgers, Cirque du Soleil, Couchsurfing, Coworking Space, Desert, Flowers, Freemont Street, hiking, Hoover Dam, hostel, Las Vegas, Mead Lake, Mirage, Neon, Nevada, Pinball Hall of Fame, Red Rock, Rock Climbing, The Strip, Zappos. Bookmark the permalink.